Los Alerces National Park - Esquel, Patagonia, Argentina. Located on the edge of the start of the Valdiviana Jungle is one of the most beautiful National Parks in the country, near Esquel. By Route 259 and 71 (partially paved) to access the National Park Los Alerces covering an approximate area of ​​263,000 hectares. 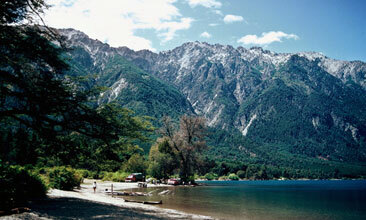 On the left bank of lake Futalaufquen is the Park Maintenance, the Interpretation Center and further administrative and operational units. From Port Limonao you embark to start the more attractive tour of the area. It runs on their way lake Futalaufquen waters, Los Arrayanes river, Lake Verde and Lake Menéndez. When because of low flow of the Arrayanes river, the boat can not leave Port Limonao, the ride is done as well arriving by road to the river and taking the boat in Port on Lake Menéndez. On the right bank of lake Futalaufquen are inns, bungalows, cabins, campings and supply stores that complement a range of services available for tourists. Lake Futalaufquen in all its glory. Los Alerces is one of the most exciting resorts, because in its natural beauty alternate unspoiled forests with lakes, waterfalls and rapids, towering mountain ranges and glaciers. In the Interpretation Center, in Villa Futalaufquen, you can get a synthetic view of the natural aspects of the park, and also the information needed to enjoy the ride of different interpretative trails: cave paintings, native flora, Cerro Alto El Dedal, Los Pumas, Cinco Saltos, Tio Mindo Waterfall, among others.